My girls have been taking their end-of-year tests this week. It's been fairly entertaining for me. You can tell we've not done much standardized testing - in the past, they've taken the Woodcock-Johnson test, which is nothing like the fill-in-the-bubble kind they took this year. Yesterday, I saw Abbie come out and get her iPad. I asked, "Are you done with your test, Sweetie?" She said, "No, I need to look up what 'perpendicular' means." I got to explain that if she doesn't know something, that's fine, but she can't look things up while she's taking the test. She was not amused. Today, I heard the girls talking and went in to tell them they needed to be quiet. "Emma's just explaining how to factor and cancel," says Abbie. I tried very hard to keep a straight face, and told them they are not allowed to help each other on their tests, either. The looks they gave me were priceless - they were aghast. Emma informed me that she is against testing. If she only knew, right? Then, we had to go explore "The Woods." "The Woods" are a small line of trees and brush between our house and the neighbors. We had a dead tree fall across our driveway last week, so he wanted to go look for more dead trees. 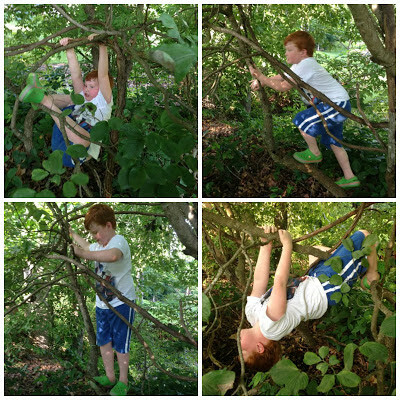 Then he found a small, gnarled dogwood tree with a really big vine crawling up through it, and discovered he could sort of climb it. This afternoon, we got to go back out and look for more climbing trees. Alas, we don't have any that are good for climbing. Poor boy. He worked hard to climb what we have, though! WhenI told him it was time to come in, he asked if we could please do "just one more thing." He wanted to go on a nature walk. I agreed. He said, "You know, Mom, part of a nature walk is finding out what things are." Yes, son, I know this. I thought he might want to identify things and was debating running in for an insect book when he said, "Oh, look, this is a stick. And look over here! Another stick!" We spent a few minutes finding interesting sticks and even found one that looks like a gun. He said, "This was the best nature walk, EVER!" LOL.. your kids crack me up! Did you suspend Isaac for finding a stick shaped like a gun? ;-) Loved this post - the part about the testing was excellent. Your daughter did just what I tell people my kids will do if they find gaps in their knowledge - they'll just go look it up or get someone to explain it to them. Katy - LOL about suspension! If my son were participating in anything related to formal school work, I might consider it. Or not! Ha! I love that my girls are resourceful when they need information. Apparently I forgot to explain the bit about that not being allowed during testing. They crack me up.